Fairfield Prep’s Thomas Quinn attempst a shot against Malden Catholic goalie William Driscoll on Wednesday night at the Wonderland of Ice in Bridgeport. 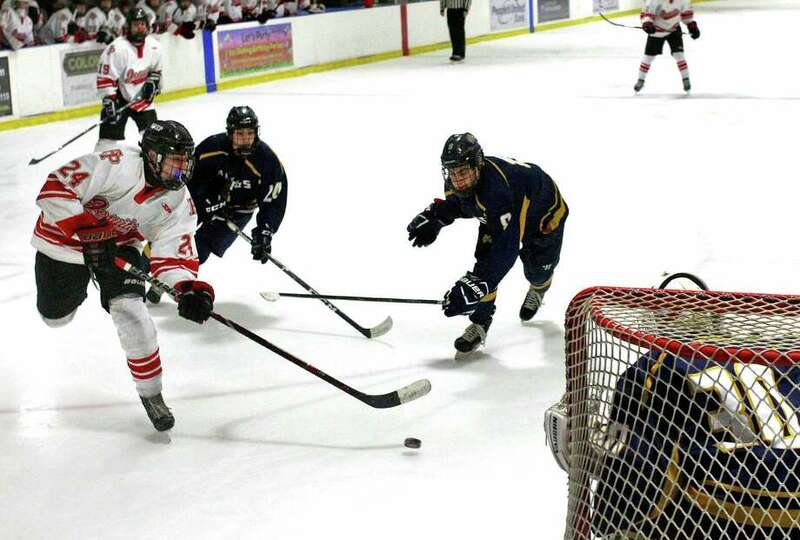 BRIDGEPORT — Fairfield Prep got contributions from just about everyone Wednesday night at the Wonderland of Ice, including the first goals for a couple of senior defensemen. Evan Farruggio opened the scoring, and Jack Carroll gave the No. 4 Jesuits a five-goal lead in a game they finally won 6-3 over Malden Catholic of Massachusetts. “They’re both three-year players,” Jesuits coach Matt Sather said. The coach credited a couple of forwards-turned-defensemen, senior Peter DiDomenico and junior Cooper Eckert, for helping generate offense in recent games with their vision on the breakout. “That (balanced offense) comes from moving the puck better and building some confidence,” Matt Sather said. The Jesuits, back to .500 for the first time this season at 6-6, have won three in a row and four out of five. Farruggio, Anthony Clericuzio and Axsel Sather (twice) gave Fairfield Prep a 4-0 lead in the first period, and Carroll’s goal stretched it in the second. After the Lancers (1-13) slashed the lead down to two goals, Chandler DuMont’s goal with 2:52 left put it away for the Jesuits. Records: Malden Catholic (Mass.) 1-13; Fairfield Prep 6-6. Goals: MC—Nick Julian, Joe Tranchina, Matt Soucy; FP—Axsel Sather 2, Evan Farruggio, Anthony Clericuzio, Jack Carroll, Chandler DuMont. Assists: MC—Sean Noonan, Brendan Curtis, Paul Bentubo; FP—Tommy Quinn 2, Mason Whitney 2, Matt Ambrosio, Matt Wenger, Lucas Baksay, Farruggio, Colin Bella, Calyb Reeves. Goalies: MC—Aidan Plant (4 saves), William Driscoll (10); FP—Andrew Stietzel (28). Shots: MC—31; FP—20.